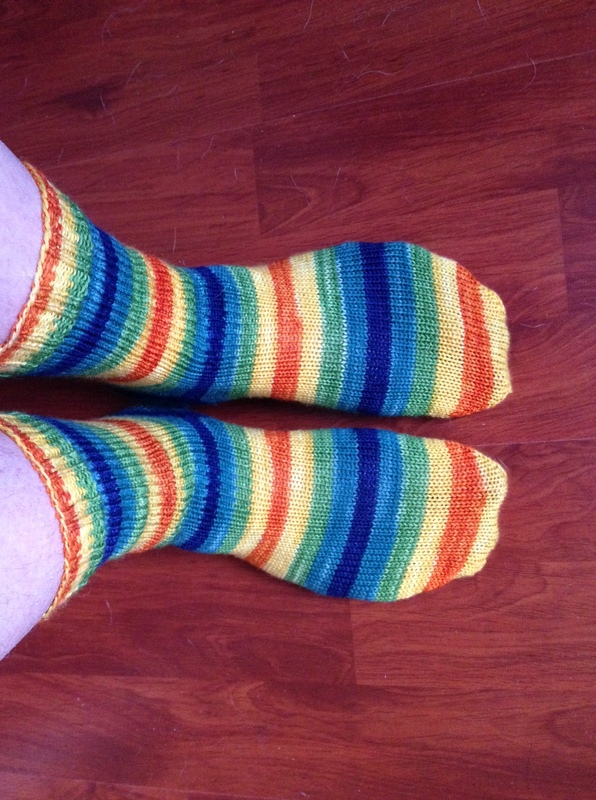 My first FO of 2015 is early…mostly because they are plain stockinette socks in self striping yarn. I always find self striping yarn seems to knit itself; I guess that’s because it’s easy to talk yourself into “just one more stripe” and it never gets boring. I cast these on the week before Christmas because I was feeling blue and not at all in the holiday spirit, and I wanted something cheerful. This yarn is definitely that. Extremely bright and colourful, it was just the cure for what ailed me. As an aside, this is my first Turtlepurl yarn and I quite liked the base…not at all splitty, easy to work with and produced very nice socks. 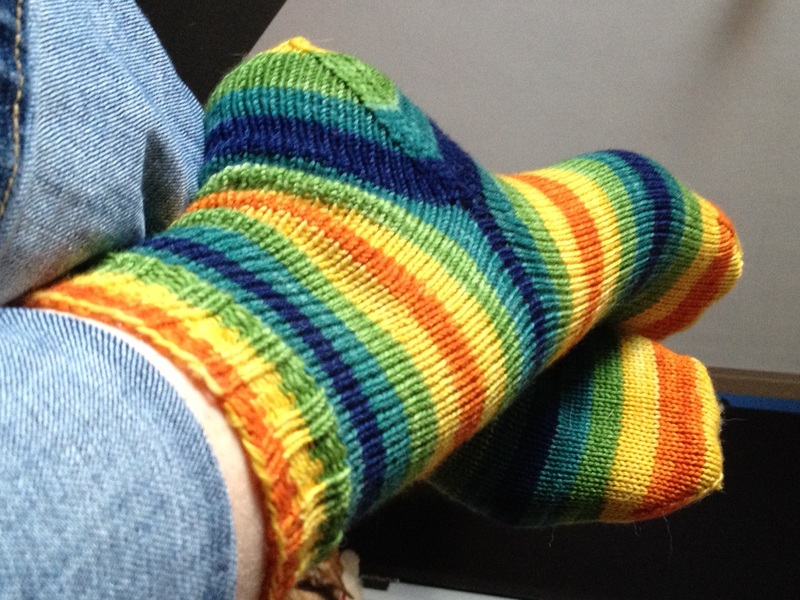 My friend Christina had just completed a pair of striped socks using a pattern with an afterthought heel, and I was convinced to try it myself when my quasi-OCD self fell in love with the unbroken stripe pattern. I have to admit now, though, that I remain unconvinced. I followed a tutorial that Christina recommended and I even did a search and found another that advertized heels with no holes. Yet, where I picked up the stitches to fill in the gap, I got fairly substantial holes. I had tonnes of yarn so I “sewed up” the open spaces, but still. Either I made a mistake (which I am absolutely willing to admit that I might have!) or the tutorial was off. I will give it another try before tossing out the baby with the bathwater, so to speak. but if I encounter the same difficulty on a second pair, I will likely go back to my standard sock pattern and not worry about the stripe pattern being just a touch off. 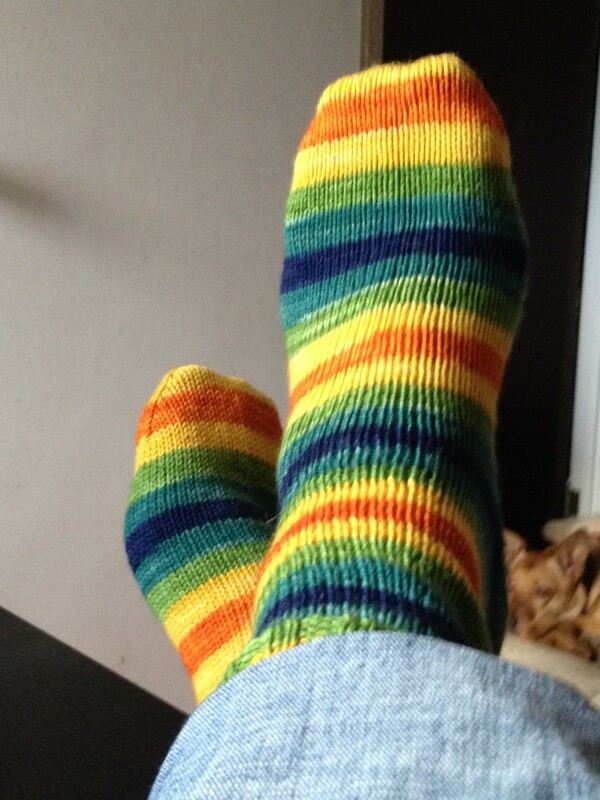 Pattern: There really wasn’t one…cast on 56 stitches and knit three stripes worth of stripes. Then stockinette until heel placement per tutorial. Knit to toe…do toe to 14 stitches on each needle (my first three toes are all the same length so pointy toes don’t work for me at all) and Kitchener. Go back and pick up stitches for heel. Knit one full stripe, then decrease like a toe until 8 stitches on each needle and Kitchener. Did I Learn Anything New? Yep! Afterthought heel. Would I Make Another? : I will try this method one more time. Pretty. I may have to try some of the stripey yarn!